Time to set your personality free,Hapgo Crocodile Car Mount is exactly what you are looking for. *Ultra Unique Crocodile Shape Design. *Vivid expression and emulated surface. *Stability and mobility all in one. *Additional stickers to keep stable on dashboard. 【Unique Crocodile Design】:Emulational Crocodile skin,embedded green eyes with vivid expression,this personalized car mount will definitely stand out among the common ones. 【Anti-slip Teeth and Friction Base】:The crocodile teeth are designed to provide various angles combinations to find the most comfortable viewing angles;the silicone teeth and rubber base give stable support with more friction to prevent your mobile devices from being crashed. 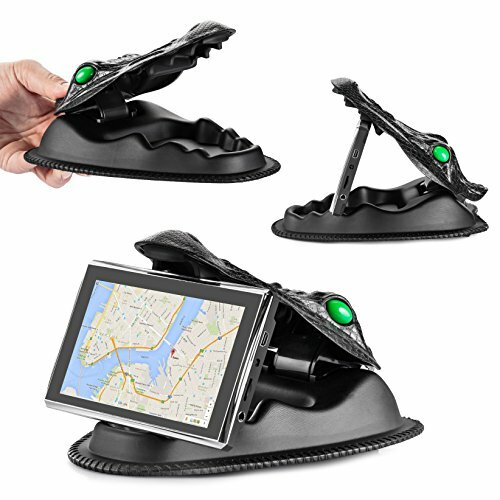 【Ideal Gift Choice】:Putting it in your car for GPS,tablet and smartphone.Unique design added more scores as an elegant gift. 【Lifetime Warranty】:HapGo Team is confident to give you quality lifetime warranty. If you have any questions about this product by HapGo, contact us by completing and submitting the form below. If you are looking for a specif part number, please include it with your message.